By the time we hit New Smyrna Beach, we’d been gone from home for 14 days. 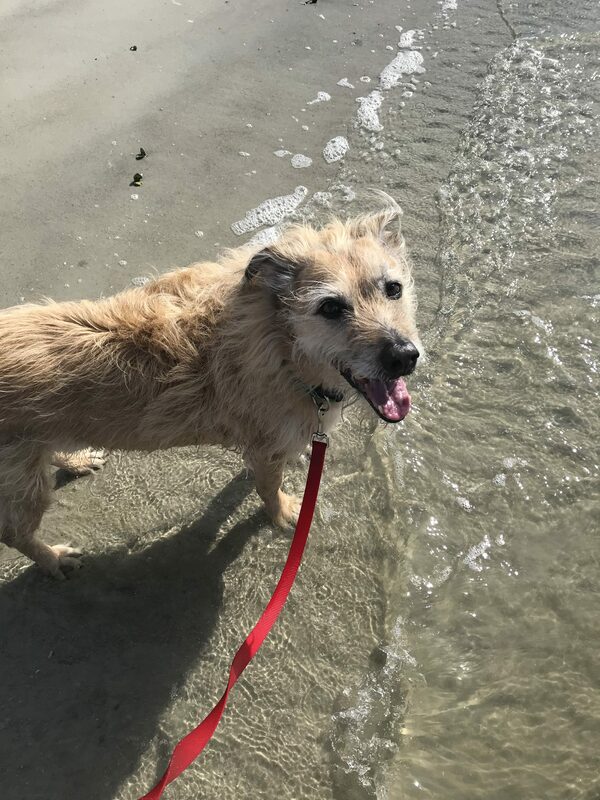 We’d visited Destin, Crystal Springs, Ft. Meyers Beach, and now we had one more chance to stall and an official dog beach to put our paws on before beginning the journey back to Arkansas. Henri and I arrived late Thursday afternoon. While he rested from the drive, I went with my friends to check out downtown. After dinner at a place where “I could see water,” but it was dark, so I couldn’t, we headed to Flagler Avenue. The only thing open late were the bars and it reminded me a lot of the strip in Daytona. My initial take was that it wasn’t a good place for dogs, but what I saw the next morning gave me a different perspective; I’ll get that in a minute. We poked our heads into a few spots to check out the scene, but with musicians just starting to set up, there wasn’t a lot going on. It was the Thursday after New Year’s and just after 9 p.m. Unimpressed with the scene and interested in one last ditch effort to meet an attractive, single Looper who likes dogs and redheads, my friends took me to the dog-friendly New Smyrna Marina. Located on the Intercostal Waterway, the New Smyrna Marina is a full service marina resort boasting a great view and some nice-would-be-an-understatement yachts parked at the dock. Outriggers Bar and Grille closes at 10 p.m. on Thursdays, so we saddled up to the Tiki Bar. The fruity drinks were plentiful and strong, but the bourbon selection was lacking. I’m guessing marina guests haven’t complained about it though, and based on the size of the boats docked there, they have their own bourbon; it’s probably Pappy. With a coastal casual vibe, the marina is a place Henri would’ve liked. The Outriggers menu features American favorites and Florida classics, and according to their website, they are one of the only restaurants in Central Florida with a license to purchase fresh fish from the docks. Their patio is dog-friendly and if anybody would like to meet me back there for Sunday brunch, I’d love to give the Mahi Mahi Benedict a try! After a night off, the Old Man Dog was ready to go again. 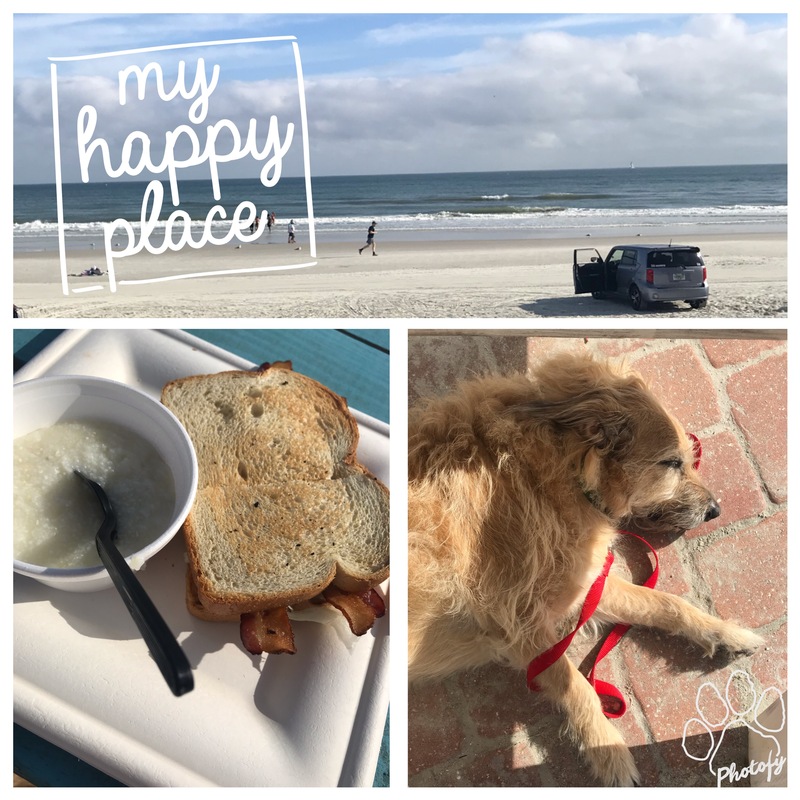 I’d located a place that was on the beach, dog-friendly, and served breakfast BLTs that you could order with a side of grits. Turns out Toni and Joe’s Patio, located at 309 Buenos Aires, was at the end Flager, the street where we were the previous night. Flager runs between the Intercostal and the Atlantic coast, and Buenos Aires is the last turn you can take before driving into the ocean. Flagler Avenue is Beach Street, USA with 25 restaurants and bars, and 34 shops, galleries and boutiques lining a five-block stretch. For $150 you can be part of this brick lined paradise, by purchasing a personalized brick to be placed along the walkway. As we drove though on Friday morning, I noticed a few dogs and a few shops with water bowls. If it’s anything like most other beach towns, some of the shops and restaurants are dog-friendly and some aren’t. Just ask before entering. Tony and Joe’s didn’t offer the most impressive BLT in the world or the greatest grits, but the view was delicious. Just like my favorite bar in Ft. Meyers Beach, the menu is simple. The service was FOUR PAW though, and the atmosphere relaxed and casual. They brought Henri water in a togo container without being asked, and the other guests were friendly, sitting around the picnic tables, chatting with us and one another. It’s hard to be cranky at the beach. I wish we’d had time to linger on Flagler and do some shopping. If only I’d known. Unfortunately, I needed to budget our time and I had already planned my lingering for the dog beach. 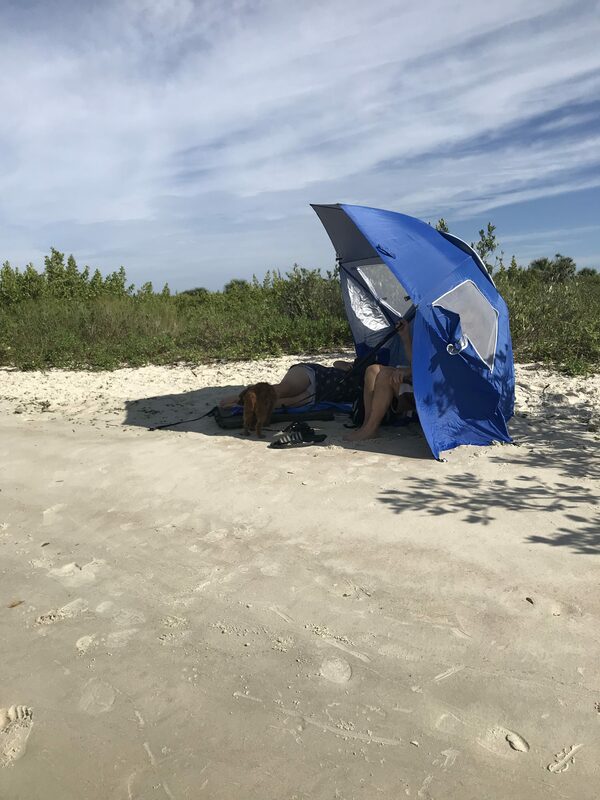 Just 10 minutes from our breakfast spot, was Smyrna Dunes Park and the Smyrna Dunes Dog Beach. It’s $10 for a day pass, which is also good for Ponce Inlet Park. If you’re vacationing for a few days, a yearly pass is only $20. So get that instead. You will also want to arrive early. The parking lot only holds about 50 cars and the park closes when the lot is full. 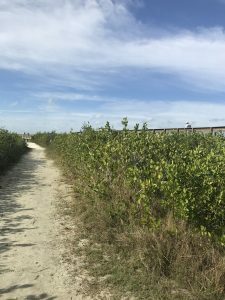 Smyrna Dunes Park is at the northern tip of New Smyrna Beach peninsula and reaches towards Ponce Inlet. 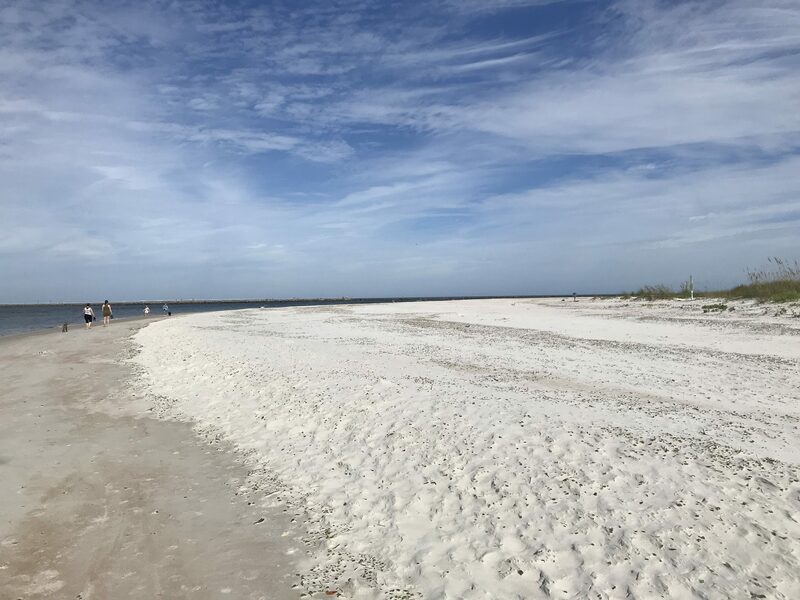 Whether driving on the beach, fishing, or strolling the 1,5 mile wheelchair and stroller accessible boardwalk, the dunes park accommodates most recreational users. At the parking lot you will find a shaded pavilion and public restrooms. Across from that is the boardwalk. Dogs are NOT allowed on the boardwalk from 10 a.m. until one hour before sunset. The dogs have their own path, complete with waste stations, through the dunes along side of the boardwalk. Paw prints on the parking lot pavement lead the way to a dog wash station located at the beginning of the sand trail. Careful with that hose; the water comes out fast! 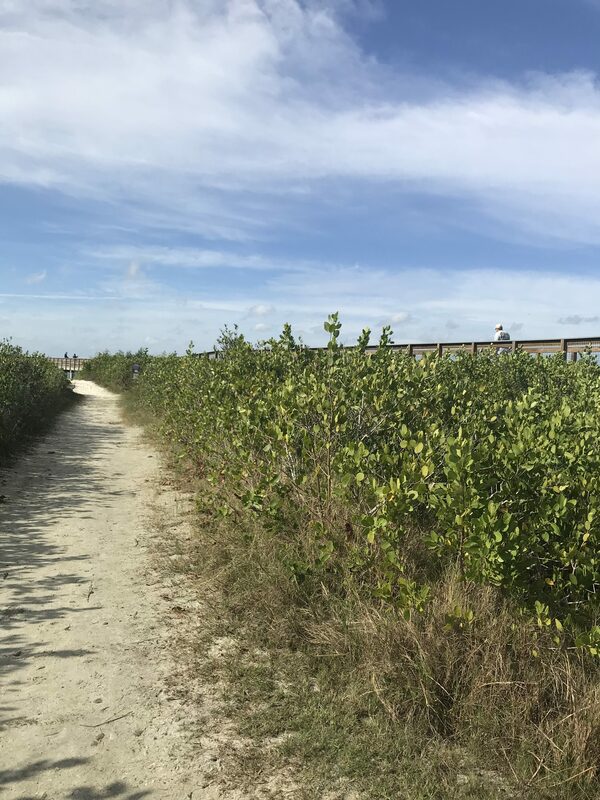 The 73 acre park boasts five ecosystems including: ocean, river, dunes, scrub zones, and saltwater marsh. It is teeming with wildlife and not without danger. The tortoises won’t get you, but the Diamondback Rattlesnakes might! I’d been letting Henri sniff the edges of the dunes until someone claimed to have spotted a 6 foot rattler. I checked with the park ranger. Yes, they’re there, along with coyotes, and they are all frequently spotted. I’d suggest keeping a short leash on your dog if walking the nature trails and at least one eye on the ground. In addition to the wildlife roaming the dunes, you should also watch out for SHARKS in the water! Yes, sharks. Volousia County is the ‘Shark Bite Capital of the World’ and New Smyrna Beach claims more shark-related incidents per square mile than any other beach in the world. In fact, according to the Ocearch Shark Tracker, Cabot, a 9 ft., 533 lb. Great White, pinged just off the coast about four hours after we left. Katherine, a 15 ft, 2300 lb. female is hanging around now, as I write. Thankfully, Henri is a wadder not a swimmer, but that black lab of yours on a 25 ft. leash, swimming off shore, looks just like a tasty seal! 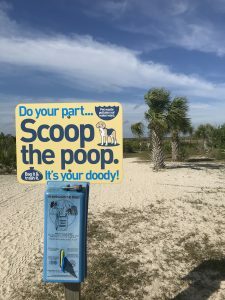 Now that you’ve been sufficiently warned, the good news is the dog beach is really nice and the parks department is doing everything they can to make dogs feel welcome. The shoreline isn’t as wide as the New Smyrna Beach shore, but with no vehicle traffic, it’s much less crowded, and of course, DOGS! YAY! I saw several groups of people who looked prepared to make a day of it with beach umbrellas, coolers, and dog bowls. If you’re packing a bunch of stuff to the beach, I suggest you bring a wagon to haul it. Your pooch does have to be on-leash at all times within the park, including on the beach. The leash MUST be under your control, like in your hand (we got in trouble for this while playing with a new friend), but there is no limit on leash length. Short leash those walks through the dunes and don’t let your pup stray off the path. I really can’t stress this one enough. Screen shot your pooch’s vaccination records and keep it on your phone. This isn’t a requirement to enter the park, but if there’s an incident with another dog, they’ll ask for it. Y’all shouldn’t be traveling without your records anyway, but the screen shot on the phone is a GREAT idea! Be cautious when approaching other dogs on the beach. Not everyone is as well-behaved as you. If there’s a fight, you both have to leave, and can even be banned. Follow the signs and obey the rules. Dogs are not allowed on the main boardwalk but they are allowed on the fingers that lead to the beach. It is clearly designed. When traveling with pets it can be difficult to find places that welcome, as opposed to just tolerate, our furry friends. 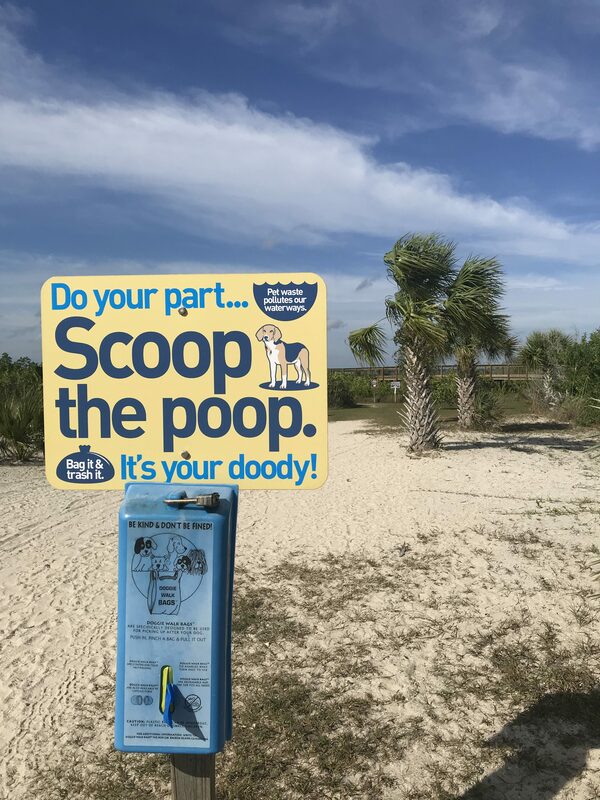 With clearly marked paths, a place to rinse before heading home, and waste stations located throughout the park, Smyrna Dune Park has done an excellent job of making it easy to enjoy your beach trip. If you visit, remember to take pictures, leave paw prints, and watch out for sharks!